How much will you value your friends and your data on social network? After you saw the video above, you could be surprised when you thought like : "Does Facebook have such an application like that?" Or maybe some of you may thought that the application on the video was the idea of how the video creator thought about the social network or Facebook should be. The correct answer is the second guess. When you have seen the full video, you absolutely will know the reason for that. In the social networks, especially Facebook, some Facebook users have so many friends, exceed 1000, or even close to 5000 friends. The question is : Do they know all of their friends on Facebook or can they remember all of their Facebook friends' name? The answer will be 'definitely no.' The research from GoodMobilePhones surveyed over 1,522 Facebook users and found out that the average Facebook user doesn't know a fifth of their friends! So, it seems that lots of Facebook users are friending only to have more friend collections and probably so that they will seem more to be popular when they have more friends than others. The next question, do one and other friends on Facebook you have are equally important? Well, Facebook might think so. Even when you can customize your parents, brother, sister, or cousins and give them the right title of who they are to you as the actual condition, what about the rest of "non family friends" you have? Besides, this title only just appear on your profile, not more. Facebook respectably see that all the friends you have on Facebook are equally important to you, your family, your classmates, boyfriend, girlfriend, colleagues, people you met at conference, neighbors, or even people that you never met, both in case when you actually know who they are or you don't. In fact, whether you have 400 or 4000 friends on Facebook, you only communicate with some of them in the real life, and so does on Facebook. For example, when you post some information on people's wall to ask them for support, most of the time, you may only post information to someone's wall that you really know, for the reason that the probability of them supporting you would be bigger. Then, maybe you'd do this to 50 of 600 friends you have. See? Only some friends on Facebook that really "that important" to us, in a way that we can communicate with them a lot in a wide range of topics. But would you be willing to sacrifice the rest of your 550 friends on Facebook to be removed? Maybe some of you would be, but only few people that you really really don't know. Why not all? The reason might be, because I still want to see the updates from them, their status, photos, videos, and also their birthday, so that I will be able to post birthday greetings on their wall when they're having birthday. Or I can talk to them when I need them someday through their wall or message. Anyway, you must have been noticed that now Facebook is integrating Facebook message and chat in one stream. So, when you want to send a message to a person, and the person is now online at the time you send the message, then you will chat directly with them through the chat window. Personally, I think that the feel and situation between when you chat and send a message to someone is somewhat different. You would be dare to chat with them when you really know them and you think that they will be available at that moment to talk to you. But with the message, it's more free, means you will still be dare to send a message to your killer professor, for example, when you are scared to chat with them directly. But when your killer professor is online and you want to send a message to them, then you will have to wait to see him offline, so you can send "an offline" message. Well, the little illustrations above may have already explained that the connections you share on Facebook between one friends and another are different. Just like, for most person, they only often (means almost everyday, or at least they do it once in a week) have wall-to-wall conversation with less than 10 friends they have. The situation will be the same with the activity of commenting or liking photos and status of their friends. Even at one time they see many status from 20 of their friends in the news feed, they may only give comment or "like" to the person that pretty close to them (whether in real or cyber world) compared with the other friends that they don't share a close connection, even when those other friends post very interesting photos and status and you see and read it on your news feed. Talking about news feed, sometimes you might ever be in a situation when you see in your newsfeed that few of your friends (or not few?) post something (status, pictures, etc) that is really irritating, annoying, or make you angry or jealous, don't you? Or are you a kind of person who will post anything about your life on Facebook and somehow you don't want certain of friends to see it? So, maybe you ever wish that you can hide your status from some friends, and vice versa, you may not wish to see someone's status? Well, the good news is that on Facebook you can control it by modifying your privacy setting (under the Account tab), and then click the "customize settings" (the one written in blue color letters). You can change it by changing on "post by me" between Things I share by clicking the customize option and you can hide it from some friends that you desire (to hide your status, photos, etc that you post in order those person will not able to see it on their news feed). And if you don't want to see any annoying updates from some annoying friends that you have on your newsfeed, you can change on "Can see wall post by friends" between the Things others share, and you can select customize then type the name of your friends in "Hide this from These people...."
Was that easy? No, it wasn't, the bad news is, when you want to select many friends (e.g. around 70 from your 800 friends. Those 70 are all your seniors at college). 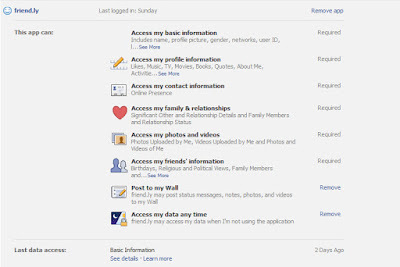 So here, it is important for Facebook users to customize their connections and interactions, so they can classify between their 1500 friends, which one are their classmates, friends at the same school at the same extra activity with them, people they met at conference, family, boyfriend, ex-boyfriend, neighbors, employers, colleagues, high school friends, people thay they never met but they know, or even people that they don't know at all. Aside from that it can make easier for Facebook users to post information, share story, or hide their updates; it will be easier for them to remember their tons Facebook friends, where they meet, what connection they share, etc. Just like in the illustration video from Youtube above, you can classify your Facebook friends that you ever met under the Facebook "I know your name" application. But it should be highlighted that this mechanism is totally different with Facebook group. You can still see all the updates from all of your friends in your news feed no matter what connection you share if you wish to, or you can give a restriction "only for your colleague friends", for example, that will only be able to see your updates in their news feed. It will be much easier than selecting one by one name of your 1500 Facebook friends to check "who are my employers on my friend lists?" So, maybe you will start thinking about the "interest-centric-interaction" on social networks. Because nowadays most social networks have the same perception that between one and another friends that the users have, all of them the are the same important, so when one shares something, it will worth the same to all of their friends. Yet, the real condition, is that it will have the same value to all of their friends who have the same interest with them or share the same connection, such as under the same company, or else. Now you can check your Facebook newsfeed, and you can make a selection between the recent updates from all of your friends, "which one is relevant to you?" After that, you can go to your friend lists, can you classify in 3 minutes who are your classmates among your 1000 friends? And when you see someone's (or more) name and photo in your friend lists or in a tab of Friends having birthday, have you ever been in a situation when you start thinking who is he/she, and how did you know he/she? That is similar but different with the story in the video above, when someone forget someone's name but actually they know each other. That is, Facebook fails to address that issue. Friends are important, but do all of them share the same connection, have the same interest with you, and equally important to you? Ok, now let's talk about the data or content you have on Facebook and other social networking sites. Do you think that when you post something and add information on your Facebook wall or profile, those contents will only be yours and only visible to your friends? Ok, maybe my friends will see my cute photos and save it in their laptop memory. No, it's way more dangerous, complicated, and worse than that. It's not only me who have that kind of perception. In 2010, Sophos's "Security Threat Report 2010" polled over 500 firms, 60% of which responded that they believed that Facebook was the social network that posed the biggest threat to security, well ahead of MySpace, Twitter, and LinkedIn. Writers for The Wall Street Journal found in 2010 that Facebook apps were transmitting identifying information to "dozens of advertising and Internet tracking companies". The apps used an HTTP referrer which exposed the user's identity and sometimes their friends'. Facebook said, "We have taken immediate action to disable all applications that violate our terms." As Tom Eston, creator of the web site socialmediasecurity.com points out, the very business model Facebook, and other social networking sites like Twitter, stands on is making user information as public as possible in order to generate new ways to make money. What kind of business is it? We reveal it later. Facebook said in one of its privacy setting, "The more info you share, the more social the experience". Ok, so, how social it would be? It would be too surprisingly social, as Facebook also change its settings to Facebook users info. The changes were introduced on April 18, 2010. Before, the users can hide some information, such as friends list, hometown, and likes and interest. But after those changes, it became publicly available and couldn't be hidden. Even more,"As a result of these material changes, Facebook requires users to designate personal information as publically linkable 'Links,' ‘Pages,' or ‘Connections' or to no longer make such information available,"the complaint states. Many Facebook users previously restricted access to this profile data, which includes users' friends list, music preferences, affiliated organizations, employment information, educational institutions, film preferences, reading preferences, and other information." When the changes went live, Facebook presented users with a pop-up screen compelling them to link their profiles to various pages selected by Facebook based upon content entered manually into the user's profile. The user could either link their profiles to all selected pages, choose pages individually, or click the "ask me later" button.Well, those are the complaints given from Electronic Privacy Information Center (EPIC) and Federal Trade Commissions (FTC) demanding that Facebook cancel new features introduced in mid-April that compel users to share more information than before. EPIC writes in the complaint, "Even if users designate content as private, Facebook will hide the information on the user's profile but disclose it elsewhere, such as on friends' pages, community pages and third-party websites. For example, even if users disable Facebook's new "instant personalization" feature, their information may be disclosed to third party websites if any of their friends have not disabled the service." Talking about third-party, it must be about business and the money always comes from advertising and other business involved in it, such as applications you sometimes use on Facebook. In the latest episode of the gang that couldn't get privacy straight, it was revealed by the Wall Street Journal that many of Facebook's popular applications were unintentionally transmitting the names of the social network's members and, in some cases, their friends' names to dozens of advertising and Internet tracking companies. According to Symantec, certain Facebook applications have been inadvertently leaking "access tokens" to third parties such as advertisers and analytic platforms. Symantec estimates that close to 100,000 Facebook apps were enabling this leakage in February 2011.When you install an application on your Facebook account, a little window pops up. This window usually asks you to give the application certain permissions, such as the ability to see your info and publish posts to your wall. When you click "Allow," the application is granted these permissions--which are also known as "access tokens." Most of these access tokens expire after a short period of time, but Facebook also allows applications to request "offline access tokens." Offline access tokens allow the application to access your Facebook account even if you're logged off, and do not expire until you change your Facebook password. Facebook has been alerted to the situation and has fixed the problem, Symantec is happy to report. However, third parties may still be able to access your information if they were given offline tokens that don't expire until you change your password. So this means you should change your password. So, what kind of our information can they access? Facebook merely said that it will only be the basic information that we set to "everyone". Case in point: A quiz designed by the ACLU that shows Facebook users just how much information they hand over to application developers every time they agree to install a new app. Want to take that quiz to find out who you were in a past life? Each time you do, almost everything on your profile, even if you use privacy settings to limit access, is made available to the creators of that application.Yes, almost everything on your profile. You may check at 'Privacy Settings' under the 'Account Tab' and click on 'Edit your settings' under the 'Apps and Websites' at the bottom of the page. On the 'Apps you use', you may see what applications you currently ever and still use. And when you click on Edit Settings, you will be directed to a page where you will find "You have authorized these apps to interact with your Facebook account" and the names of the apps. Click 'Edit Settings' on the app you desired. It said that "This app can : access my basic information, access my profile information, access my contact information, access my family & relationship, access my photos and videos, access my friends' information, post to my wall, and access my data any time. At 'post to my wall' and 'access my data any time' on the right side you can find 'remove' tab, means you can remove that function from the app, so that the app friend.ly won't be able to post to your wall and access your data anytime again. But, what about other functions? It said 'required', means you can't change them and the app will still be able to access those information from your profile. It seems that EPIC complaint was right, Facebook still disclose the information to the third party, which in this case the app developers, even when we set it to private. If we don't like it, we can remove the app, but just bear in mind that the app still has our data and information before we remove it. Just like what it stated on Facebook FAQ about the applications on Facebook, "Does deleting an application from my profile mean that the developers no longer have access to my information?" No. Deleting an application from your profile simply means that an application will no longer have access to any new information that you share. If you would like a developer to permanently delete all of your information, you will need to contact the developer directly by following the directions outlined here. and another point that Facebook mentions, "Keep in mind that if you'd like the information that you've shared with the application to be permanently deleted from their records, you will need to contact the developer directly." Just like what EPIC complained to Facebook "... their information may be disclosed to third party websites if any of their friends have not disabled the service." The service means applications on Facebook. So, even we are not using or has removed the application, but our friends are still using it, so the application can still access our information, and vice versa, when we're using the application, but our friends aren't, the app may be able to access the information from our friends. But we can control it just like what it stated under "General Application Support : Application Safety and Security" on Facebook, "You can control which of your information is available to applications and websites when your friends use them by going to the "Info accessible through your friends" section on the Applications, Games, and Websites page. To get to that page, go to the Privacy Settings page from the "Account" drop-down menu located at the top of any page on Facebook and click on the "Edit your settings" link under the Applications and Websites section towards the bottom of the page". You can unchecked the boxes, if you don't want that information to be accessible by the apps through your friends when they use it. Has it done already? No. There is another shocking thing. 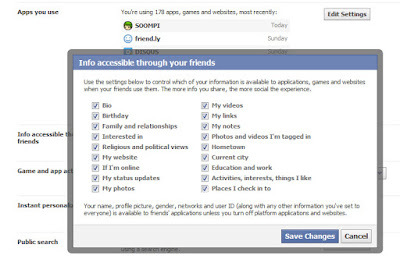 On May 2010, Network World discovered that Facebook apps are added to our profile without our knowledge. "If you visit certain sites while logged in to Facebook, an app for those sites will be quietly added to your Facebook profile. You don't have to have a Facebook window open, you don't need to be signed in to these sites for the apps to appear, there's no notification, and there doesn't appear to be an option to opt-out anywhere in Facebook's byzantine privacy settings. The apps appear to be related to Facebook's latest sharing features and tools. The sites currently leaving this trail all have Facebook integration, and the list includes heavyweights such as the Gawker network of blogs, the Washington Post, TechCrunch, CNET, New York Magazine, and formspring.me. It isn't entirely clear what information these apps are pulling from user profiles or feeding back to Facebook. They aren't automatically visible to friends viewing your profile page, but if you go to an application's profile page, you can see a list of your friends who also have that app installed, essentially getting a unintentional peek at their browsing habits. On the other side there are sites like the Washington Post's, which has a Facebook Network News box showing a list of your friends who have recently shared a Washington Post article on Facebook". Too sophiscticated, but too far to cross the users privacy. There are another complained by EPIC to Facebook on April 2010, "Moreover, the act of "liking" pages may reveal personal data "without clearly indicating to users when their personal information is being given to third party websites." Oh my, so Facebook track too much from the information that we give, even when we set it to private. We never know when, how much, to whom, and under what terms would our data will be given. And what about the intellectual property of our data? You must read the "Statement of Rights and Responsibilities" of Faebook point 1) and 2) below. For those of you who concern about your contect and its IP, such as the good quality photos and videos that you created and posted on Facebook, don't be too stubborn in the future to claim that those beautiful stuffs are yours and nobody can never use them. Ok, so now and forever, Facebook will have all our stuffs and use them in any purpose that they wish.